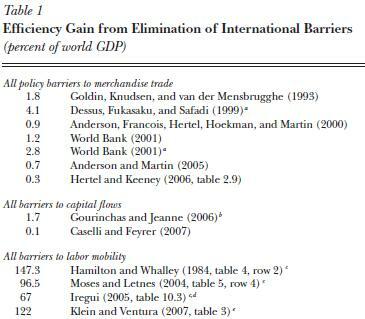 This page describes some academic literature that suggests a median estimate of doubling of world GDP under a regime of free global labor mobility. Much of the literature is speculative, and there are many uncertainties in all estimates. We have also included references to blog posts that critically review the estimates and point out their strengths and weaknesses. There is wide variation in the views of just how much open borders will grow the economy, even among open borders advocates. The case for open borders as presented on this website is robust to this wide range of estimates. A literature summary by Clemens (2011) cited estimates that free global labor mobility would increase gross world product (GWP), also called “world GDP”, by somewhere in the range of 67-147%. The estimates suggest that even partial liberalizations of migration could yield gains greater than the estimated gains from complete free trade or free capital flows. Clemens (2011) also does a simple back-of-the-envelope calculation, using conservative estimates, to show a plausible gain of 20-60%. A doubling of GWP would correspond to about 23 years of economic growth at a 3% rate, or correspond to economic difference between a middle-income country and a First-World country today. Since the publication of Clemens (2011), others who have worked on estimates of the global economic impact of open borders, or on critiques of the estimates, include John Kennan, Scott Bradford, George Borjas, Nathan Smith, and Carl Shulman. Their respective contributions are discussed below. To the extent that these estimates are broadly correct, they highlight the case for open borders as well as its importance relative to other causes. Should these large estimated gains from an expansion of international migration outrage our economic intuition, or after some consideration, are they at least plausible? We can check these calculations on the back of the metaphorical envelope. Divide the world into a “rich” region, where one billion people earn $30,000 per year, and a “poor” region, where six billion earn $5,000 per year. Suppose emigrants from the poor region have lower productivity, so each gains just 60 percent of the simple earnings gap upon emigrating—that is, $15,000 per year. This marginal gain shrinks as emigration proceeds, so suppose that the average gain is just $7,500 per year. If half the population of the poor region emigrates, migrants would gain $23 trillion—which is 38 percent of global GDP. For nonmigrants, the outcome of such a wave of migration would have complicated effects: presumably, average wages would rise in the poor region and fall in the rich region, while returns to capital rise in the rich region and fall in the poor region. The net effect of these other changes could theoretically be negative, zero, or positive. But when combining these factors with the gains to migrants, we might plausibly imagine overall gains of 20–60 percent of global GDP. How big is a doubling of world GDP? The CIA world factbook gives a 2012 gross world product (GWP) of $84.97 trillion (PPP), and per capita PPP GWP of ~$12,400 (the table below uses a different source). One way of thinking about doubling GWP is in terms of the per capita income of different countries today. Doubling GWP per capita would bring the world average close to that of economically depressed Greece. Bringing the world average to British or Japanese standards would triple GWP, while global American or Hong Kong per capita incomes would quadruple GWP. A different comparison is to the time it takes GWP to double at different growth rates. In recent years GWP has been growing at 3-4% per annum (note this is total GWP, not per capita GWP, so it includes the effect of population growth). A 3% growth rates corresponds to GWP doubling ever 23.45 years, and a 4% rates gives a doubling time of 17.67 years. So, an effect that doubled total world GDP would be amazing, but not wildly beyond the kind of variation we see across space today and across time in recent history. Kennan’s is the first paper to incorporate place premium estimates (included in a paper by Clements, Pritchett, and Montenegro) into a model of how the world would look under open borders. The previous literature cited by Clemens in his double world GDP paper did not use place premium estimates, primarily because these estimates (and for that matter even the concept of place premium) simply weren’t available at the time those papers were written. The goal here is to guess what open borders would look like in practice, and the theoretical work is an instrument for guessing in a methodical and informed way where intuition and experience are of little help. Now, two big things we would like to know about open borders are (a) how many people would move, and (b) how much would world GDP actually increase. If I’m not mistaken, Kennan could easily derive estimates of these things from his model. But he doesn’t. He doesn’t tell us how world GDP would rise under open borders, in the short or the long run. He doesn’t tell us how many people would move, or where they would come from. I think Kennan’s model implies a short-run increase in world GDP of about 65%, and I’m pretty sure in the long run world GDP would double. Since the increase in the effective labor supply comes from growth in the populations of rich countries where labor productivity is high, I think Kennan’s model implies that rich countries’ populations would more than double due to immigration under open borders. I pretty much believe Kennan’s model, though of course it’s a simplification. The biggest criticism it’s open to is that the factors that make labor productivity high in rich countries depend on the composition of the population in those countries and wouldn’t survive vast influxes of people. Let in a few million immigrants and they’ll assimilate to high labor productivity, but let in tens or hundreds of millions and they’ll drag labor productivity down. Note that while Kennan’s model does not predict that labor productivity in rich countries would fall, it does predict that wages would fall. It wouldn’t surprise me if labor productivity fell a bit too, but I doubt it would fall that much, even if from the perspective of public opinion, the effects of open borders seemed like a catastrophic social upheaval. The case of California seems instructive here: there’s been a huge demographic change, and all sorts of apocalyptic rhetoric, and the state has become a bit less of a beacon than it was, but California’s First World status hasn’t changed at all. Of course, California doesn’t have open borders, but I expect open borders would be a more intense version of the same phenomenon: enormous perceived social upheaval, but no general fall in living standards for natives. It depends a lot on how it’s managed. 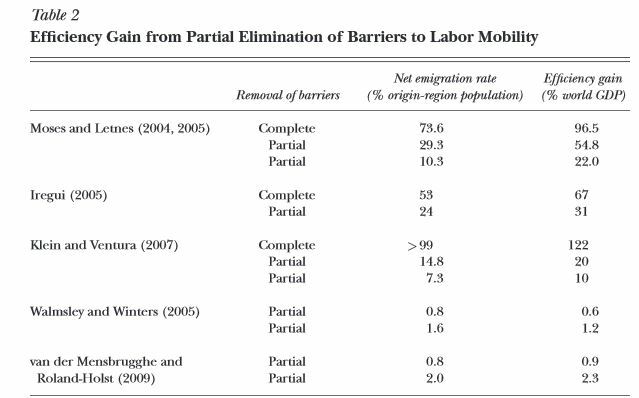 Another paper that came out after Clemens’ literature summary was The Global Welfare and Poverty Effects of Rich Nation Immigration Barriers by Scott Bradford (2012). Double World GDP? Another Economic Model of Open Borders by Nathan Smith, Open Borders: The Case, June 4, 2014. George Borjas, an immigration economist at the Harvard Kennedy School, wrote a detailed academic critique of the estimation exercises in his book Immigration Economics (Harvard University Press page, Amazon). A similar critique can also be found in Borjas’ 2015 Journal of Economic Literature essay titled “Immigration and Globalization: A Review Essay”. The gated version is here and an ungated version is here. Trillion Dollar Bills on the Sidewalk: The Borjas Critique by Bryan Caplan, EconLog, July 16, 2014. The comment section includes a comment by Michael Clemens. Note on Borjas: Non-Binding Constraints Are Not Necessary by David Henderson, EconLog, July 16, 2014. Open Borders Action Group discussion, starting September 8, 2014, on Borjas’ paper. The post was by Grieve Chelwa, and includes comments by Carl Shulman, Fabio Rojas, and Nathan Smith. Upward and downward biases in the “double world GDP” estimates of the gains of open borders by Carl Shulman, Reflective Disequilibrium, January 26, 2014, offers great perspective on the relation between estimates of global economic gains and migration flows. The whole post is worth reading. I discuss recent estimates that open borders could double gross world product through increases to migrant productivity. Such a doubling would be extreme, but not out of the range of our experience: it would be equivalent to raising world per capita income to the level of Greece (U.S. levels would quadruple world product), or a couple decades of continued economic growth. However, it would require the great majority of the developing world to migrate. I discuss the migration levels required for the estimates, polling and historical data bearing on migration levels, and population and economic growth trends that affect the estimates. Over several decades, the impact estimates seem too high, requiring implausible quantities and rates of migration, although potential effects remain large. Over the longer term, boosts such as population growth in poor countries and increased education for second generation migrants increase the maximum potential of migration beyond doubling world output, but development in poor countries, changes in place premium, and other changes may reduce gains over time. The Global Economic Impact of Open Borders: My Take by Nathan Smith, Open Borders: The Case, February 8, 2014. This post was written before Smith began drafting the paper, and offers an early draft of his arguments. Open Borders Action Group post by Nathan Smith, July 30, 2014, with a teaser about his forthcoming draft paper. Open Borders Action Group post by Nathan Smith, August 6, 2014, linking to a first draft of his paper. This post got 76 comments, including many by Carl Shulman and Vipul Naik. Guest post: The Global Economic Impact of Open Borders (Nathan Smith) by Nathan Smith at Lars Christensen’s blog (The Market Monetarist), August 12, 2014, providing some more details on his paper. My Draft Paper: A Bit of Elucidation in Q&A Format by Nathan Smith, Open Borders: The Case, August 13, 2014. Many writers have attacked migration restrictions, and advocated open borders, from an ethical standpoint, including Joseph Carens in The Ethics of Immigration, Teresa Hayter in Open Borders: The Case Against Immigration Controls, and myself in Principles of a Free Society. What I propose to do here is different, namely, to describe as best I can what a world of open borders would look like. Because current policy is very far from open borders, constructing such an estimate involves large feats of extrapolation, and a heavy reliance on economic theory to sort these out. It is well-known that international migrants can enjoy very large increases in wages and living standards. One of the best contributions to this literature, “The Place Premium: Wage Differences for Identical Workers across the US Border,” by Michael Clements, Claudio E. Montenegro, and Lant Pritchett (December 2008), finds, for selected developing countries, that the “place premium”—the ratio of what workers could earn at home relative to the US—ranges from 1.99 in the Dominican Republic, to 6.25 for India, to 11.92 for Egypt, to 14.85 for Nigeria, to 15.45 for Yemen. But these results apply at the margin and under the status quo. They cannot legitimately be interpreted as indicative of what would happen to all Egyptians, or Nigerians, if controls on migration were removed worldwide. An educated guess about that can only be made in the context of a comprehensive theory of how the world economy works, fitted to the data as well as possible, but able to be solved for equilibrium when policy is changed. Several academic papers attempt to do this. Naturally, my opinions about the best approach differ from those of other authors. For example, I think Klein and Ventura (2007) underestimate international human capital differences, I dislike the ad hoc procedure by which Kennan (2012) incorporates cultural constraints on migration into his model, and I think Bradford (2012) uses an indefensibly high estimate of the direct costs of migration. Apart from these differences of method, however, these authors simply do not describe a world of open borders in sufficient detail to help readers much in imagining what a world of open borders would be like. This paper presents a much more detailed (though of course, let it be borne in mind, quite tentative, speculative, and fallible) simulation of how open borders would change the world. 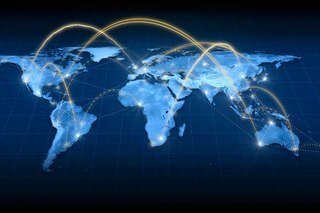 Double world GDP versus scope insensitivity, by Vipul Naik, Open Borders: The Case, May 10, 2012. Doubling world GDP versus doubling utility: a technical note by Vipul Naik, Open Borders: The Case, January 22, 2014. See also all our blog posts tagged double world GDP. Killing the goose that lays the golden eggs, one of the main concerns regarding the global negative impact of open borders. See also the global harms list. For posts on estimating quantities related to open borders, see our blog posts tagged quantitative estimation. For posts on open borders advocacy, some of which rely on the double world GDP-type estimates, see our blog posts tagged open borders advocacy. Credit for map featured at the top of this post: the Pioneer Business Review. Pingback: Migration and Human Rights (49): Rights and Non-Rights Based Reasons to Favor Open Borders | P.a.p.-Blog // Human Rights Etc. Pingback: antibuerokratieteam.net » Tear down this wall! Pingback: For Whom the Bell Shifts? – Put A Number On It!